Design thinking lays out all possible options, then chooses the most appropriate. Three years ago, we were talking about a disruptive industry, but today we are living in one. Change, be it regulatory evolution or consumer expectation, is constant. The food industry is challenged with an aging workforce, high attrition rates, operational challenges due to regulatory changes, customer demands, and cultural diversity, to name a few. Employees at the plant level are at the forefront of producing safe food for consumers. Empowering employees with the right information and the knowledge to succeed in their roles is the critical difference between a recall and ensuring customers’ trust in a product. 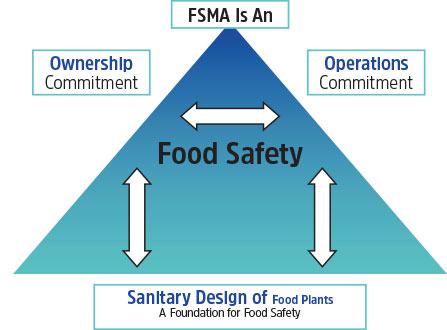 So how do we help those in charge of safeguarding our food understand this important role? Training and education programs that help people understand the why is often a common answer — empowering them to be responsible, make decisions and reach out for help when needed. With a myriad of training options available, it can be an overwhelming challenge to weave in company-specific practices. A tried-and-tested solution is to use design thinking. Design thinking, often associated with R&D or innovation groups, is a creative and systematic approach to lay out all possible options and choose those that are most appropriate. It is a human-centered and prototype-driven approach, where you are constantly fine-tuning your thought process to create solutions that are desirable, feasible, and viable. Following are the key components of integrating design thinking into your education and training process. Assemble: Building a design-thinking team is often a matter of assembling a multi-disciplinary team with people from different backgrounds. People who can take a 50,000-foot view are especially important in building holistically framed solutions. Understand: Empathize with and place employees’ needs and conditions ahead of the solution. Frontline workers put in long hours and are often on their feet performing repeated actions every day. Seeing things from their perspective is instructive for developing the right approach. Empathize with your employees by observing their behavior in the context of their lives, engaging them in conversations, and eliciting stories. Empathy is the centerpiece of a human-centered design process. Define: The goal of the define mode is to craft a meaningful and actionable problem statement. Based on your understanding of the problem, you can synthesize various thoughts into structured observations and powerful insights. Creating a user persona is helpful in preventing scope creep, and ensuring you stay on track. One example would be developing a training program to ensure plant employees are placing the right label on the right product during the manufacturing process. Explore or Ideate: Akin to conducting a hazard analysis, in which you list all potential hazards, this stage involves brainstorming and listing ideas. The focus is on quantity, not quality. Once you have conducted a successful brainstorming session, narrow down and select those options that fit the problem statement and persona. Use sticky notes, create mind maps, sketch, implement Draw Toast (https://www.drawtoast.com), or follow other similar approaches for ideation. Prototype: To avoid losing innovation potential, two or three ideas are selected for prototyping in response to the problem statement. In this iterative process, create an inexpensive, tangible version of the chosen idea(s) including how the training will look and the props it may require. Using sketches, mock-ups, or a small implementation are possible means to prototype trainings. Test: Typically conducted in tandem with the prototype phase, the test phase allows users to interact with the learning prototype. Testing is an opportunity to understand the user and empathize with a potential solution (rather than with the user, as in the empathy step). Get feedback by creating experiences or asking users to compare options. Evolve: Regularly reassess if the developed training solution is desirable, feasible, and viable. Even the most established training programs and manuals undergo updates to account for new technologies, information, or audiences. A successful design-thinking process is one in which people are willing to push boundaries and come up with out-of-the-box ideas. Since these ideas are tested continuously for their resilience through the brainstorming, prototyping, testing, and evolving stages, heavily supporting an idea or influencing it will not result in a favorable solution for frontline workers. So, thinking about how employees feel and what they need is key to developing effective solutions. Today the inclusion of cannabinoids into foods and beverages, in states where adult use of cannabis has been legalized, ranges from cannabis butters and oils to cannabis-infused wine and seemingly everything in between. It has even gone upscale with restaurant chefs creating tasting menus of all sorts of foods crafted with cannabis — although no chefs worth their herbs and spices would consider recommending that raw cannabis be added to baked goods as Toklas’s recipe suggests. Brownies however are acceptable. Brownies are good delivery devices because they are baked. The main psychoactive ingredient in cannabis is THC (delta-9-tetrahydrocannabinol), which naturally occurs only in very small amounts in the plant. The form that predominates is Tetrahydrocannabinolic acid (THCA) or THC-Acid. THC-Acid has little binding affinity at the body’s endogenous CB1 and CB2 endocannabinoid receptors, so it has little psychoactive effect. The neutral, decarboxylated form does, but it needs to be “toasted” at about 250°F to decarboxylate the material to make it available for receptor binding. Cannabis consists of more than 420 components and at least 60 pharmacologically active cannabinoids with the two best-described cannabinoids being THC and cannabidiol (CBD). Many may have valuable medicinal properties, and medical research in these areas is proving promising for a number of disorders, but most of the other compounds are not yet well understood, and their physical effects are largely unknown. CBD does not produce any of THC’s psychoactive responses and actually appears to block some of the effects of THC by acting as an antagonist at the CB1 and CB2 receptors. The body reacts to ingested cannabis differently than smoked. With edibles, the onset of effects is delayed and peak concentrations in the bloodstream are lower, but the duration of pharmacokinetic effects (the high) are extended. This is due to the phenomenon, first-pass metabolism: for there to be an effect, the cannabis needs to go through the GI tract, then be shunted to the liver where it is modified for excretion and gradually absorbed into the bloodstream. This results in a smaller fraction of the ingested cannabis extracts that circulates to the brain. But both the GI tract and liver contain certain drug-metabolizing enzymes and some have an interesting effect. As one is digesting the cannabis-containing food, some of the drug-metabolizing enzymes are creating another potent psychoactive metabolite of THC called 11-OH-?9-tetrahydrocannabinol (11-OH-THC), which has a longer half-life than THC. Because both it and the remaining THC circulating in the bloodstream are psychoactive, the two, together, may significantly add to the level of effect. In contrast, when smoked, THC is absorbed directly through the lungs bypassing the liver, so virtually no metabolism takes place before it reaches the bloodstream and brain. The THC then quickly distributes to other body tissues and only a small fraction of it remains in the bloodstream to be converted to 11-OH-THC and other metabolites. Because THC is fat soluble (highly lipophilic), the duration of effect also can be impacted by the fat content, whether the food is saturated or unsaturated, and whether the individual has an empty stomach. Thus, the effect can be prolonged and can last for several hours as it is slowly metabolized. Edibles also create other safety concerns. Many pesticides and extraction solvent residues are fat soluble, so they, too, linger longer. Because of this most, states mandate that raw materials, extracts, and finished edible products undergo laboratory testing for pesticides, heavy metals, and microbial contaminants, as well as appropriate THC concentration. This brings a wrinkle into the laboratory where additional extraction and analytical methods must be devised to be able to test for these materials in the presence of fats and carbohydrates which can mask or otherwise impede analysis. Thus, food producers, chefs — and the edibles consumer — need to keep in mind that judging the duration and peak effect of edibles is complicated, as it is impacted by not only the amount of THC but also the fat content of the food. And whether or not required by state law, testing is important, as other unwanted chemical compounds can remain throughout processing that may have negative impacts.